Yesterday was the Feast of Andrew, Apostle. Once again, I am tardy! His brother according to the flesh was Peter and in, through and under Jesus Christ a brother forever. Andrew was called to confess Jesus is Lord. According to tradition, he was martyred for it on an X-shaped cross. 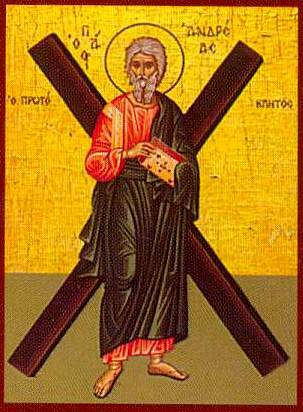 “If I feared the punishment of the cross, I would never have preached the mystery of the cross”, Andrew is said to have said. He is the patron saint of Scotland and his X-shaped cross is on the Union Jack of the United Kingdom. When I look at this icon I think of searching for buried treasure with the map which has an “X”, as in, “X marks the spot”. Our map is both the Bible and the Lutheran Confessions to show us where “X marks the spot”: first, a manger then later the Cross. This where and when our salvation occurred. The Bible is the true compass to show us the Way (see John 5:39). This is where true treasure is buried and worth digging up and selling all to have and hold as we have been held: Matthew 13:44-46. Other religions purport to have maps leading us to the divine. The Biblical faith alone shows us where the Lord came down to us and for us and our salvation because without Him we are dead and lost (see Luke 15 andEphesians 2:1): again, X marks the spot.